Two first-half goals were enough to earn Northampton victory over Hartlepool in League Two. Cobblers scored early on as Marc Richards, assisted by Nicky Adams, struck from the centre of the box. Pools striker Rhys Oates was denied by Adam Smith before Cobblers defender Ryan Cresswell headed in from a corner. 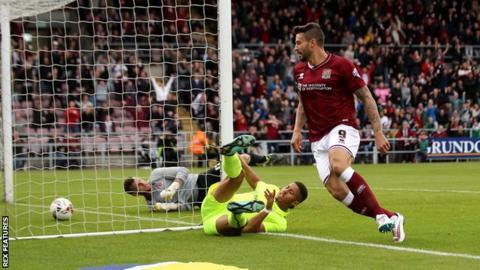 Rakish Bingham pulled one back for the visitors, rounding Smith and finishing into an empty net, but the Cobblers held on for a sixth win of the season. "At times we played really well, we were looking for a quick start and we got it but we took our foot off the gas a bit at 2-0. "We are disappointed with their goal because we were on top at the time, but a win is a win and we are delighted to get the three points. "We played quick positive football and when we do that we are a good side." Match ends, Northampton Town 2, Hartlepool United 1. Second Half ends, Northampton Town 2, Hartlepool United 1. Marc Richards (Northampton Town) wins a free kick on the right wing. Foul by Brad Halliday (Hartlepool United). Substitution, Northampton Town. Jason Taylor replaces Nicky Adams. Corner, Northampton Town. Conceded by Scott Harrison. Attempt blocked. Nicky Adams (Northampton Town) left footed shot from the left side of the box is blocked. Corner, Hartlepool United. Conceded by Darnell Furlong. Dominic Calvert-Lewin (Northampton Town) is shown the yellow card. Kudus Oyenuga (Hartlepool United) is shown the yellow card for a bad foul. Darnell Furlong (Northampton Town) wins a free kick in the defensive half. Foul by Kudus Oyenuga (Hartlepool United). Substitution, Northampton Town. Dominic Calvert-Lewin replaces Sam Hoskins. Substitution, Hartlepool United. Brad Walker replaces Michael Woods. Substitution, Hartlepool United. Kudus Oyenuga replaces Rhys Oates. Corner, Northampton Town. Conceded by Brad Halliday. Nicky Featherstone (Hartlepool United) wins a free kick in the defensive half. Connor Smith (Hartlepool United) is shown the yellow card for a bad foul. Foul by Connor Smith (Hartlepool United). Attempt missed. Billy Paynter (Hartlepool United) right footed shot from the right side of the box is close, but misses the top right corner. Corner, Northampton Town. Conceded by Jake Carroll. Attempt missed. Marc Richards (Northampton Town) right footed shot from the left side of the six yard box is close, but misses to the left.